Whether you are relocating to Conroe, The Woodlands, or Spring area; Do you need local information? Do you already live here, are stuck in a rut of doing the same thing over and over? Would you like to branch out with new ideas of where to play, shop, or dine? Do you need ideas of where to travel right here within our Lone Star State of Texas? Keep reading! I have just the spot for you to check out that will give you all kinds of ideas. I confess, I was stuck in one of those do the same 'ole thing over and over ruts myself. I started my day off with the idea - let's see what is right here in my area of Montgomery County. I wanted to know what I can do new and then share my learned information. First stop was at the Shenandoah Visitors Center which, by the way, is open 7 days a week 8am-5pm. "Where to Shop" - Ideas both locally in Shenandoah such as The Portofino Shopping Center, it also includes "Area Shopping" - The Woodlands Mall, and Old Town Spring. New information to me was The Swim Shop of the Southwest, located inside the CISD Natatorium. "Where to Stay" - Shenandoah offers seven hotels. "What to Do" - choose from a drop down list of Recreation, Cultural, Entertainment and Sports Facilities. Dine - Fine Dining, Fast Food, or something in between in Shenandoah. Those were just some of the local ideas. 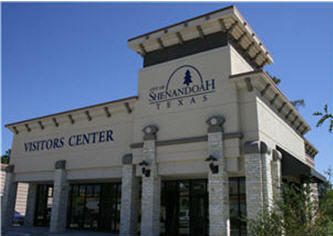 In addition the Visitors Center is recognized by the State of Texas as a Texas Tourism Information Center because it is stocked with information from across the Lone Star State. This is a good starting point to plan your next road trip! Now ... think about it ... it's time to move and where are you going to live? That's information I can help you with! Check out my website by clicking JudyReynolds.net . It's loaded with Real Estate information and you will want to save JudyReynolds.net to your favorites.